To break the fast, or not? Maria has been studying nutrition for the past three years and she is going to make a fabulous nutritionist and dietician when she completes her studies shortly. Why? Well, of course, she knows her stuff, but it’s not just because of this. It’s also because she is a big pain the arse. Let me explain. Maria understands that we need fuel. Some people need it more than others. Men need more fuel, generally speaking, than women. Those with physically demanding jobs might need more fuel than sedentary souls. And if you run, well, you need fuel for that, too. To train, you need fuel. You can’t go on a road trip without filling the tank. Humans are the same. Are you enjoying that, Laura? It’s FOOD! exercise freaks. No Sir, I love food. And I love running. Just combining them is difficult for me; making them work together. The first day of Cruce de los Andes (our 3-day, 106km trek/run from Chile to Argentina), was eight hours of climbing up a volcano, trekking in snow around it and running the steep slopes back down again. 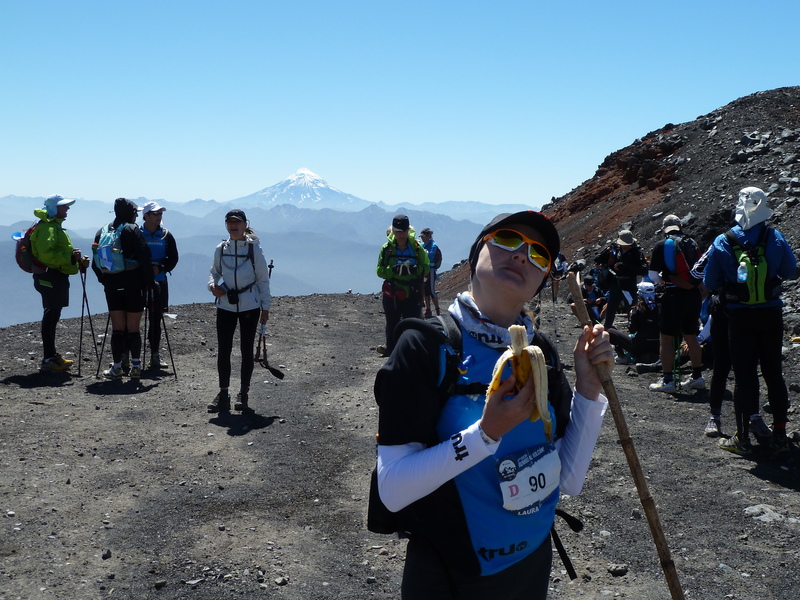 We had prepared peanut butter rolls to see us through, as well as energy bars and fruits. I know I had a banana on the way up, probably because Maria said it was time we ate something (we were about to start climbing through snow). At the top I was done after a bite of the peanut butter sandwich. “Eat it,” Maria said. “Just finish it. You need something.” Slowly, so slowly I chewed. And don’t even get me started on those gels and energy bars and balancing calories… I’ve been running in the mornings back in London and I always have the same food dilemma. I’m not someone who wakes up ravenous. While Martin has already gobbled tea and toast, I’m just boiling the kettle, waking my insides up. I’ll always have breakfast “in a bit”. So, I don’t eat before I head out running. However, what this means is that I’ll feel I’m running on empty for the last part of my run. I know this. And I have tried eating before I go. The reverse happens. I feel sluggish and slow at the start, and I hate that as well. So, I am open to suggestions and nagging. What light snack or breakfast works for you in the morning before a run? What options do I have? I am ready to try them. You’ve got a carte blanche to be as big a pain in the arse as you want. I’m listening. Finally. In a previous post I discussed the factors that come into play to make or break a run. One that I find particularly important is nutrition. It’s all about timing and composition. Honestly, there aren’t many hours of the day when food isn’t running through my mind. Whether it’s studying for my nutrition courses, thinking about what I’m going to cook for dinner or just being hungry, it’s usually always floating around my head somewhere. Today while running, it surfaced yet again. I suddenly realized that in all the preparatory talks that Laura and I are having we haven’t tackled the nutrition portion yet. My guess is this is right in line with Laura’s plan, but I’m not going to let her get out of it. Day 1 is said to last between 4 and 9 hours. That means we’re going to need a lot more than water and our first aid kits in our backpacks. The organization will be providing us with breakfast, lunch and dinner. This is exciting, but it doesn’t account for the hours we’ll be away from camp. We should be consuming between 30-60 grams of carbohydrates per hour while we’re out there (without factoring in the altitude). Normally that would equate to a gel packet and some Gatorade every hour. But will this be sufficient? Or will we want to swallow so many of those syrupy packets in such a short period of time? Where would we find the Gatorade considering there won’t be the normal hydration stations found at a road race? Discussions and decisions are needed, but maybe dried fruit, bananas and oranges, granola bars or gummy bears should be packed into our CamelBaks as well. Regardless, a small container of peanut butter will be traveling with me. What’s a pre-run meal without it?